Passionate and committed to creating a successful business or organization? Interested in using your gifts and talents to make a difference in the lives of your clients and organizations? Feeling that your money issues are holding you back from creating the business that you desire? What stops many business owners from using their creative gifts and talents and making a difference in the world isn't their lack of motivation, competence or knowledge.... It's actually - Their Relationship with Money! Why? Because Money is at the Heart of every decision you make in Your life and Your Business and learning about your Money and your Mindset isn’t enough. You have to take action and move past your money story, your money blindspots and your money habits - and that takes time and support. Join me and 6 other Like-Minded Entrepreneurs in this 6-session Mastermind/Group Coaching Program to get support, and experience the synergy that will help you Break Free from Fear, Confusion and Self-Sabatoge with money and put the systems and processes in place to Manage your Money so that you can Create the Business of Your Dreams!! Content – each session Coach Estelle will present a brief teaching from her 5-Step Journey to Freedom Coaching Process. We’ll use step-by-step exercises and you’ll receive downloadable handouts and checklists that you can use again and again. Accountability – each session we’ll use the powerful Coachville Play 2 Win™ R-A-C-E Model (Results-Actions-Challenges-Evaluation) to help you stay on track and celebrate your successes. Support – You’ll have the support and encouragement of other group members along with a private community to share wins, challenges, resources, etc. Coaching – Each participant with have their own individual "Spotlight" session where they will get the opportunity to get individualized coaching, brainstorming and support from Coach Estelle and the other participants. Private Community Access- You‘ll have access 24/7 to ask questions, share your insights, wins and challenges and get support. Bonus #1 – Sacred Money Archetypes® Assessment. You'll discover Your Sacred Money Archetypes ®, unlocking what makes You tick when it comes to money. 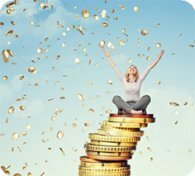 You’ll also receive a Customized Sacred Money Archetype Map that summarizes your top 3 money archetypes detailing the gifts and challenges of each, your Empowering Money Mindset, Your Money Contract and more. This Powerful Assessment is only available from Certified Sacred Money Archetype Coaches. Bonus #2 – Play Two Win ™ Intensive Session – You’ll have access to a kick-start session using the powerful Coachville Play Two Win™ Coaching Method where you’ll be guided to create Your “Action Oriented, Result Focused Game Plan”. You’ll be able to immediately put your plan into play and begin to achieve your desired outcomes. Bonus #3 - Clear Your Money Clutter -Like any type of clutter, unresolved money situations can pile up, robbing you of time, energy and freedom. You’ll have access to a bonus recording that will help you focus on clearing away these unwanted situations, (and the physical clutter associated with them) so you can begin to experience renewed confidence and financial freedom. Regularly $497 but for an introductory period, you can register for $397!